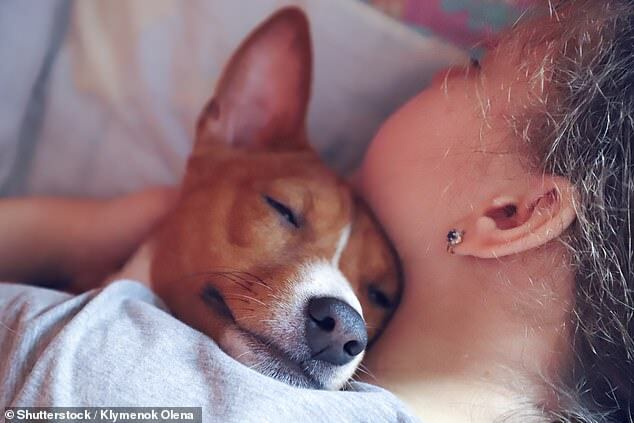 Dogs make better bedfellows for women than people – or cats, according a new study. The groundbreaking research from Canisius College (which is for people, and is named for one – a saint – not for the genus that Saint Bernards belong to) found that more than half of women snuggle up to at least one dog. And those that keep canine company at night tend to get to bed earlier, sleep better and get up earlier in the morning. Sleeping next to a furry dog may even make women feel more comfortable and secure than a human partner can. Humans and animals have had a symbiotic relationship for thousands of years. Dogs and cats have both long abounded our camps, caves, farmlands and, today, homes, but we definitely, intentionally bred dogs for keeps. Canines are naturally hierarchical creatures that we were able to breed to look at us as their pack leaders and train to act as our protectors and hunters. We even have a clear chemical interaction with our dogs. When dogs and humans stare into one another’s eyes, our levels of of the love neurochemical, oxytocin, sky-rocket, Japanese researchers have found. Dogs feel the love, as seen by the 130 percent rise in their oxytocin levels when the gaze up at their owners. But people really feel the love when they look into their canines’ eyes. Oxytocin is the same chemical that makes mothers – human or otherwise – feel warm and fuzzy when they look at their babies so that they feel attached and protective of their helpless little ones. When women and men alike look at their dogs, their oxytocin levels spike surge by 300 percent. This may explain why more than half of the 962 adult women surveyed in the Canisius College study felt such a sense of ‘comfort’ next to their canine cuddlers. The 31 percent who had at least one cat didn’t get the same snuggly sense from their pets. We really didn’t mean to get so close to cats, research suggests. Instead they snuck into our lives to eat our scraps – which these solitary creatures much preferred to mice or insects that they caught in the wild – and we mostly let these unaffectionate animals stick around because there was something familiar about their faces. We don’t share an electric gaze like we do with dogs or other humans, but cats’ faces are, bizarrely, proportioned like human babies’ faces – and the two are about the same size. Big round eyes in the center of the face, short little nose, rounded head with a small, slightly pointed chin (and a lot more hair). That’s good enough for our animal brain to say ‘okay, you can stay,’ apparently. But in our sleep, we seem to sleep through the cat trick. Though women with any kind of pet or any kind of partner experienced more sleep disturbances overall, those who fell asleep cuddling a cat or a person woke up feeling less well-rested. The seven percent of women who got the bed to themselves got better sleep overall. So, if you really want to rest well, consider kicking everyone out of your bed. Though sleeping together releases that same magical cuddle chemical, most of us really don’t like to sleep next to our partners. Just 13 percent of people sleep spooning or otherwise cuddling up to their partners in bed, while 63 percent push the other person away. And women have it worse. Men, according to a Sleep.org study (at least) say they sleep better with a woman beside them. Women said just the opposite. Plus, women are more likely to be startled awake by the sound of someone next to them sawing logs – and men are worse snorers than their female counterparts. But, if you’re like 11 percent of American adults that are afraid of the dark, or you just don’t want to be lonely, you might want to try huddling up with a hound.